A Shepherd's Heart: You're Not A Waste Of Time! 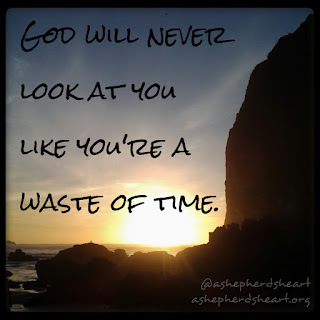 You're Not A Waste Of Time! You may feel like God is too busy for you or that you've lived so a horrible life that He thinks you're a waste of time. With The Lord, there's Never a lost cause or a waste of time. He's not like the imperfect human beings you experience in your life who are conditional in their love and care for you! He's full of grace, love and truth for you. He's, there for you and loves you unconditionally so why not abide in Him and seek Him with all that is within you (heart, mind, soul and strength) each day!? What are you waiting for? He's constantly trying to draw you to Himself so why not listen to Him? Prayer...It's not just a lifeline!